Of the 23 signed up about 17 people showed up. The expected rain and cold temperatures that were forecasted cause some to stay home. 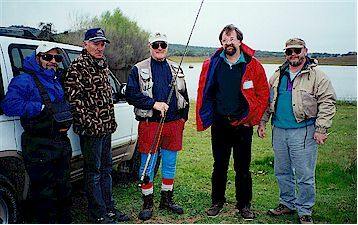 For the rest of us, we were able to fish for the whole week-end without any rain during fishing time. It did rain from around 8 PM Saturday night to about 4:30 AM on Sunday morning. All three ponds had temperatures from 47 to 55 degrees F at the hottest on one of the ponds. The fish were not receptive to poppers. We have found out that until the temperature of the water gets to 59 to 60 degree F at a minimum, don't expect much surface action. Only a few fish were caught on poppers the whole week-end. 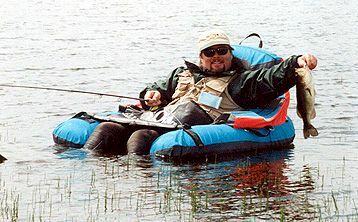 John Margaroni was using a bead head nymph with hex colors and was catching black bass on the big ranch pond near the edges. Most fishermen caught a few fish but not like we did last October. David Harris really showed us how to do it with rubber worms crawled along the bottom of the ponds. His tally for the three days was between 60 to 75 fish landed. He really lost count he was doing it so well. I'm not much of a worm fisherman, but I tried it with using my fly rod and paddling real slow crawling the worm on the bottom. I also borrowed a spinning rod on Sunday. For the week-end I caught 36 bass with rubber or plastic worms. I really feel that it is harder to fish with worms than it is with flies. 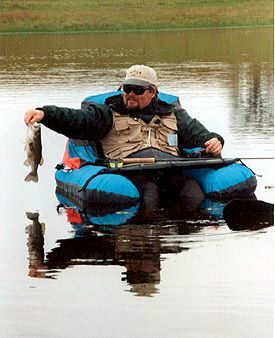 Really successful bass fishermen learn to feel the differences of the bottom, the rocks, the limbs and the take by a fish. We are primarily a club where everyone uses a fly rod to catch fish. I probably use a fly rod 90% of the time I fish, but I'm willing to swallow my pride if my fly rod is not working with either poppers or flies and switch to proven plastic worms fished Texas style (Hook point is pushed into the middle of the plastic worm so that it becomes weedless. Try it sometime and you will find it's not that easy to catch bass until you really get the feel of how your plastic worm is working. One thing that we had a lot of was food and it was good. Everyone did themselves proud with the things that were brought. Thanks to you all for making the eats so great. John's Friday night chili was super. Harold"s tasty vegetable soup (really it is Verna's great soup) and jerk chicken wings didn't last long. Betty Pollack made great salads. Roger Johnson's big ham that was cut into small pieces for snacks was great. I can't believe Dennis Ddrobisch. For Friday night he brings a whole half of a beautiful smoked salmon that was fantastic. Then for Saturday he brings out two - 3lb bags of special flavored chicken wings and spicy chicken breasts. By the time people finished with hors d'oeuvres, they were too full for the spaghetti dinner.It's great to have good food when the fishing isn't the best. A good time was had by all. Most of us can't wait to come back when the ponds warm up and surface action occurs. Jessie Lawson's Saturday outing on May 22 should be just right for trying out poppers. The bass should be hitting surface presentations about that time. As this was the first fishout for me this year, it also showed me that I have to get out my check list to be sure I don't forget certain gear. Next time I'll be better prepared. We would like to plan another 3 day fishout at Kistler Ranch around the last part of October. For those interested, please let me know. It will be $50 each for the 3 days, like this last fishout. We can handle 25 instead of 20 as was first planned for this fishout. Hope to see you there.